All Marks and Spencer: Limited Edition Coat €120, Limited Edition Top €47.50, Limited Edition Skirt €47.50, Scarf €27 and Bracelet €27 (recognise it from anywhere?!). From August. 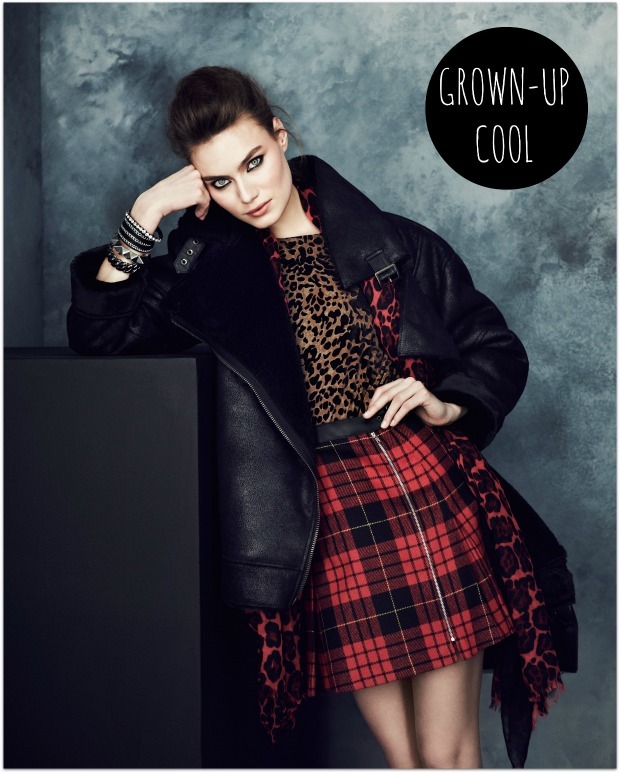 Resistance is futile: whether it’s highland or punk or grunge, tartan is the pattern of the season for AW13. Hailing from Scotland and coming of age in the 90s, I’m pretty damned happy about the whole shebang. All from Penneys: Beanie €3, PU Sleeve Check Jacket €29, Denim Gilet €15, Print T-Shirt €6, Check Shirt €13, Jeans €15, Boots €20. In stores now. Worn dressed up or dressed down, as illustrated here, tartan is incredibly versatile and will lend any outfit a dash of new season cool. Any of this little lot catching your eye? ONE: This fabulous tartan skirt is sophisticated, but with a little bit of edge. It will take you to the office or out for dinner and drinks – look for it in M&S from August, priced at €47.50. TWO: I’m a little bit in love with these chocolate plaid Converse (£49.99). Team them with jeans or with flowery dresses for a smidgeon of lumberjack chic – they’re available now. THREE: With its casual laidback vibe, this check backpack from Penneys (Primark in the UK) is an absolute bargain at just €10. It hits stores in early August. FOUR: If the backpack’s a little too studenty for your tastes, how about this structured, ladylike little number? It’s Limited Edition from M&S and will be around the €40 mark. FIVE: It reminds me just a little of the uniforms in Home and Away, but I’ve fallen for this sweet little tartan dress just the same. It’s €17 and you’ll find it in Penney from August. My autumn wardrobe won’t be complete till I’ve found the perfect over-sized checked shirt – to be worn, mainly, around my waist. 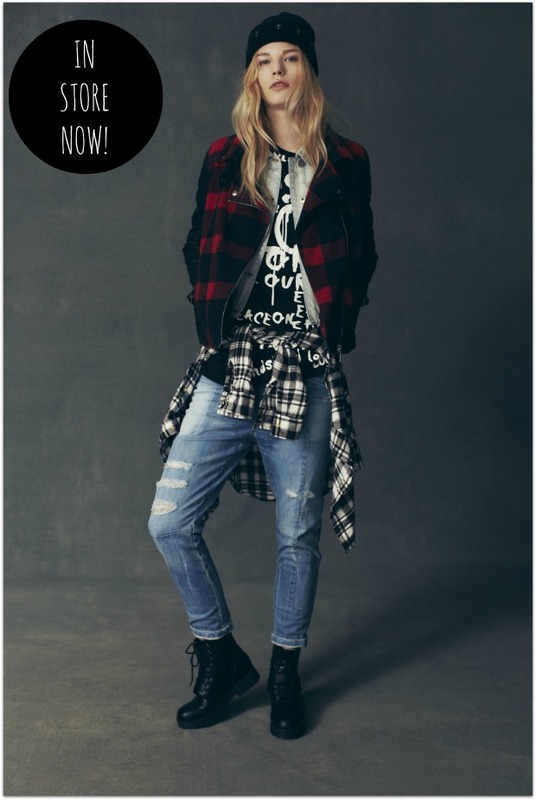 And you - are you feeling the tartan trend? 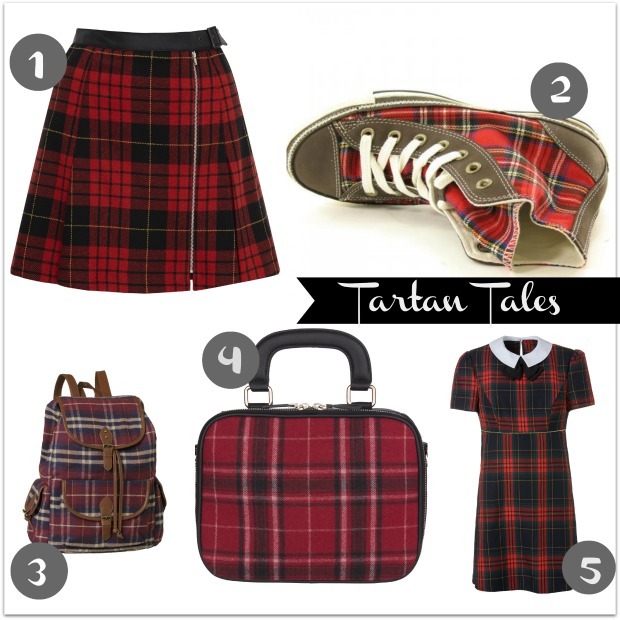 Tartan (especially in skirts) is so chic! Love me some tartan! Seriously digging that wee tartan dress! Love love love tartan. Can't wait to buy into this trend. Love those Converse! I have 8 pairs already though can they be justified?!?! So thrilled to see tartan back in vogue, its one of my winter favourites, I even have an evening dress in it. I just don't know if I can ever wear tartan! I used to have a dress just like #5 and a skirt just like #1! lol It'll be fun to revisit that preppy trend. Oh bring it Fall...I'm so ready for you plaid! Such a funky trend and so many different ways to wear it as you have shown! wish i could pull that off!